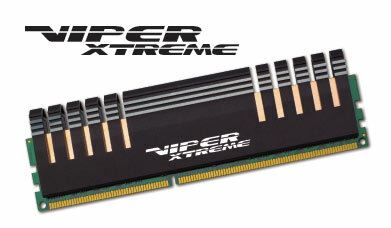 Fremont, California, USA, November 4, 2010 - Patriot Memory, a global pioneer in high-performance memory, NAND flash, storage and enthusiast computer products, today expanded the product lineup of their recently announced Viper Xtreme Series of DDR3 memory solutions. New Sector 7 (tri-channel) kits are available in 12GB and 6GB capacities with speeds of 2000MHz and 1600MHz. New Sector 5 (dual-channel) kits are available in 8GB and 4GB capacities with 1600MHz speed. The Viper Xtreme Series of products utilize a custom developed aluminum and copper heat shield to achieve improved cooling and stability. Patriot Viper Xtreme Series modules have a custom designed heatshield with a hefty copper insert (6 grams) across the DRAM chips and a slim profile extruded anodized aluminum outer piece. This unique design offers enhanced thermal performance in heat dissipation over aluminum based heatshields. Viper Xtreme modules pass a thorough qualification and screening process on multiple high-performance motherboards to ensure performance and reliability for overclocking. These modules are targeted and designed specifically for performance enthusiasts and overclockers looking for an edge in benchmark efforts and to push the boundaries of computing performance.